I really liked this book! Ellen's father, David, was in bed with a ring of criminals and gathering intel for the police so they could bring George Drayton's crime ring down. One night David made a stop to George's house when the henchmen stumble upon them, and their lives are forever changed. A handsome stranger comes to their aid, but he is killed in the process. Now Ellen is on the run from the gang and has been living her life as invisible as possible. She colors her hair and wears colored contacts and glasses to disguise her beautiful appearance. She's living in a small town, flying under the radar when HE comes along, Mr. Tall, Dark, and Moody! Luke is searching for a missing girl that's tied to his brother's death. He just knows his brother couldn't be tied to the gang of criminals. He was one of the good guys. She holds the answers he seeks to clear his brother's name and to put away the criminals that caused his brother's death. When his search leads him to a small town and a very intriguing waitress named Ellen, sparks fly! What will he do when he learns Ellen is the girl he seeks? Will she come forward to clear his brother's name, or will his gruff behavior cost him everything? The characters in this book were well flushed out, You get their back story to really know who they are and where they're coming from. I like the humor and the relationship between Ellen and her best friend Suzy. Suzy is a real spitfire, and these two ladies are a ball together. Toss in a handful of hunky men and a couple of great parents, and you have a wonderful tale. The books is fast paced with a lot of romance and action. The plot just flowed great. There are plenty of twists and turns to keep you on your toes. This is the first book in the Alpha Company Women series. I will definitely be reading more from this author! If you don't already have the first book, Vampire Addiction, go here for your FREE copy: http://www.evapohler.com/facebook. "The unique blend of the paranormal with Greek mythology is breathtaking and will leave you dying for more." --Jonel Boyko of Pure Jonel (A book review site) Buy your copy of Vampire Ascension: The Vampires of Athens, Book Three at your favorite retailer today for $3.99 for a limited time! Kindle Nook iBooks Kobo Google Play Smashwords Come celebrate this new release with fun games and prizes at our Facebook event tonight! As part of the celebration, Eva is giving away a signed set of paperbacks of ALL SIX books in her Gatekeeper's Saga, plus an Eva Pohler's Books drawstring tote full of swag. Eva Pohler is the Amazon bestselling author of The Gatekeeper's Saga, The Purgatorium Series, The Vampires of Athens, and The Mystery Book Collection. She also teaches writing and literature at a university, where she lives with her husband, three children, two dogs, and two guinea pigs. Please help us celebrate the reveal of the epic conclusion to The Vampires of Athens, written by the Amazon bestselling author of The Gatekeeper's Saga, Eva Pohler. To celebrate, we're giving away a Kindle Fire HD and a $25 Amazon gift card. We're also playing games and giving away other prizes, including signed paperbacks, the Athena Locket, and the Medusa T-shirt on July 13-14 on Facebook. A teen from New York studies abroad in Athens and discovers that vampires and demigods are real at a time when war is brewing between them. After making friends on both sides, she unwittingly becomes a catalyst to an uprising, led by Dionysus, lord of the vampires. In this final installment, Gertie, Jeno, and Hector struggle to bring a peaceful resolution to the war in Athens, but any success they make comes at great cost. How many more people must die for freedom and justice? The teens quickly learn that nothing is fair in love and war. Sometimes even love requires a terrible price. Join us for the final reveal on July 13th on Facebook here. And you can enter to win the Kindle Fire HD and $25 Amazon gift card here. About the Author: Eva Pohler is the Amazon bestselling author of The Gatekeeper's Saga, The Purgatorium Series, The Vampires of Athens Series, and The Mystery Book Collection. She also teaches writing and literature at a university in San Antonio, where she lives with her husband and three children. It’s FINALLY HERE! Happy Release Day to Mr. Hollywood! Age Recommendation: 18+ for mature themes and sexual situations. Overview: What if every move you made became a headline? Could you deal with the constant scrutiny? What if you couldn’t escape it? How would you cope? Z McCartney lives center stage as the most sought after actor in Hollywood. Women want him. Men want to be him. But sometimes things aren’t always what they seem. Hollywood’s “It Boy” is suffering badly, tormented by lost love, grief, and addiction. The question now is, will he survive? 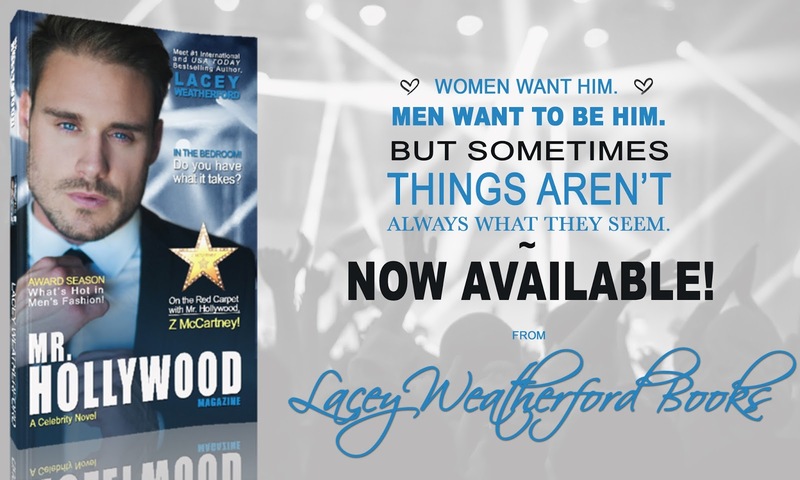 Early reviewers call this story a brilliant tale of love, guilt, trauma, recovery, renewal and exquisite emotion, mixed with steamy sexiness that is sure to delight! 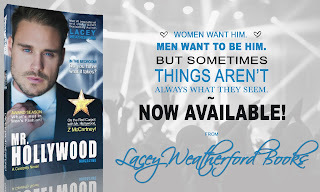 Mr. Hollywood is a rollercoaster of a ride that you don’t want to miss! EXCERPT: (In the voice of Aubrey Hart) Reaching room number twelve, I knocked lightly, glancing at the name on my chart. “I’m here for morning rounds, Mr. Carpenter,” I said through the door. “Come in,” a slightly gruff voice said. Turning the knob, I entered, balancing the items I was carrying in my other hand. “Good morning, Mr. Carp—” A small shriek escaped my lips as I stared at the man in front of me and everything I was holding clattered to the floor. Eyes widening, I covered my mouth, as shock flooded my system and I backed away. In a flash he moved, zipping behind me and shutting the door. “Aubrey, please let me explain.” His words came out in a rush as he stared at me. “You’re here. How are you here? How is this possible?” Tears came, unbidden, as I took in the extremely handsome man in front of me. He’d been a boy the last time I’d seen him in person, but there was no doubt he was a man now. My traitorous body instantly reacted to being in the same room with him, just like it had in high school. Everything felt heightened and on the verge of exploding. I’d never expected to see him again—ever. I’d made my peace with it. Yet, here he was. Unspeaking, he simply continued to stare at me, a thirsty look filling his incredible blue eyes, the same blue eyes that had hypnotized me every second I’d ever spent with him. Stop! I yelled, mentally. You can’t let him affect you like this again! Pull yourself together! Steeling myself I dropped my hands. “What are you doing here?” I said, more forcefully. A soft chuckle escaped him, and the action drew my attention to his very well formed chest that was aptly highlighted in the V-neck t-shirt he was wearing. From there I drifted to his large biceps, noting he had tattoos that didn’t used to be there. “Isn’t it obvious,” he said, redirecting my focus back to his gorgeous face and his full lips—lips that used to kiss me for hours at a time. I wondered how many other women besides me had had the pleasure of his kiss now. “I seem to have discovered I have a little drug problem.” It wasn’t until then that I actually noticed how much he was shaking. Seeing that shocked me back into my routine. “Oh my gosh! I’m so sorry. You need your meds!” Glancing at the floor, I saw the pills scattered across the papers from his file. “Let me go get you some fresh ones real quick,” I added, bending to pick up what I’d dropped and trying to scoop up the papers. “Aubrey.” My name was soft on his lips as he crouched beside me, reaching out and stilling my hands with his own. Heat streaked through me instantly at the contact. “These pills are fine.” Carefully, he pried my fingers open and took the medication, popping it quickly into his mouth. Eyes never leaving me, it was as if a thousand questions were in them. “I’m sorry I shocked you, but damn girl, it’s great to see you again.” I couldn’t stand sitting here pretending we both weren’t ignoring the giant elephant in the room. Unable to hold it back anymore, I burst into tears. “You left me.” *** Read how the rest of the story unfolds TODAY! Today we are revealing the cover for TOUCHING EMBERS by Airicka Phoenix. This is a young adult novel that is part of the Touch series. The book will be released this Winter 2015. As an added bonus, we are revealing the brand new covers for the previous books in the series as well. Life from fire. Hope from ashes. I thought I could escape him. I thought I was safe. I should have known better. For the first time in my life, I am alone to face my fate. The world I had once known is gone and I am responsible. I am the bringer of death. Everything I touch becomes ashes and I can’t stop. He won’t let me. Touch Chaos. Touch Destruction. Touch Embers! Touching Eternity (Prequel): Before Fallon was created to destroy. Before love became the ultimate weapon of destruction. There was Amalie and the horror that started a revolution that tore the fabric of humanity, of everything standing in the balance between power, hope and survival. Amalie has one wish, one gnawing desire — she wants to die. She wants to leave this world behind with its pain and darkness. She wants to finally breathe. But Amalie is a prisoner, a disease, not fit for life. She is unwanted, unnatural. She is defective, something useless and broken. Her own mother hadn’t wanted her. Her father hated her. The world shunned her and the only person she had ever loved, truly and with all her heart and soul, couldn’t stand the sight of her, couldn’t stand the thought of ever being with her. She repulsed him. Her insanity disgusted him. He’d forgotten her. He’d left her behind, deserted and abandoned her to a madman hell bent on crushing her, stealing her soul and shattering her will. But what if she’s finally given hope? A reason to live? Can Amalie finally accept the hand offering so much for so little in return? Can she love again when she has nothing left to give? Can she finally be free? Touching Smoke (book 1): I assumed I was human. I assumed wrong. I dream of death and warm blood on my hands. I dream of the day I burn the world to the ground. I dream of the day I will finally die. Running is something my mother taught me to do very well. I never knew why until the night I cause an earthquake and meet Isaiah. My shadow. My protector. My other half. I need him. I need his blood. He is the only one who can keep me hidden from the man who created me. The man who created the monster. The world is depending on me not to fall in love. But what happens when the temptation becomes too great and falling is my only option? Can I live knowing I will destroy the world because his touch is the only thing keeping me alive? And how can I trust someone as lost as I am? Touch Passion. Touch Power. Touch Smoke! Finding my past was supposed to end the nightmare. Only it was just the beginning. Entrusting the fate of the world, not to mention my and Isaiah’s life to a father I had never met is a big leap of faith on my part. But it’s a necessary risk. Ashton is the key to protecting Isaiah and keeping me out of Garrison’s clutches. He is also the only one who can tell me what I am, except what I learns is that I am from a world that is far more dangerous than anyone could have possibly imagined. As my powers grow out of control, I must pick between my mortality and a legacy that does not include Isaiah. I must summon the courage to face a destiny that will test the boundaries of everything I have ever known. But most of all, I must protect Isaiah from the monster within myself and trust the man whose toxic blood runs through my veins. Danger builds as power clashes between two evils, both seeking me to tip the scales to eternal darkness and suffering. Can humanity rise to face an ancient calling to which I am powerless to stop? Can I protect those I cares about or will their blood forever stain my hands? The Gatekeeper's Trilogy Promo Blast and Rafflecopter Giveaway! Readers are calling this series, "Amazing," "Addicting," and "One of the best modern retelling of ancient myth." Kirkus Reviews wrote that it's "sure to thrill Hunger Games fans," and Midwest Book Reviews calls it "a powerful young adult fantasy." A teen becomes entangled with the gods of Mount Olympus when one of them, Thanatos, the god of death, wants his chance at love. He makes a deal with his father, Hades, but not all the gods want him to succeed. Part paranormal romance and part adventure story, this trilogy follows Therese's adventures as she struggles to overcome the challenges the gods dish her in her quest to become like them. For one week only, from June 7th to June 13th, the digital box set of The Gatekeeper's Trilogy, usually $5.98, can be downloaded from any ebook retailer for 99 cents! That's three full-length novels, a total of 230,564 words, for less than a buck! Here are the download links: Kindle   Nook   iBooks   Google Play   Kobo   Smashwords To celebrate this one-week sale, Eva Pohler Books is also giving one lucky winner a $40 gift certificate of his or her choice, plus a signed paperback set of the trilogy. Keep reading to find out how to enter. This series was initially written as a trilogy and can end with the third book, or you can keeping reading through all six. This box set includes the first three books. If you want to keep reading, come back here to follow Therese's adventures as she strives to become a goddess in the ancient Greek pantheon. I lived an ordinary life. Perhaps it was life of loss, maybe even a lonely life, but ordinary all the same. Never in a million years could I have predicted the events that would unfold after that fateful delivery. Some Seer I was. But that doesn't matter any more, that life, the one I'd thought was my reality, was nothing more than a weakly constructed facade. The lines between reality and fiction have blurred, leaving me with nothing but the cold hard facts. The world is vastly different than I ever understood. Guardians and Seers are real, and I have the power within me to tip the balance in a war between good and evil that had been brewing since the beginning of time. The fight was coming to a head and the outcome hinged entirely upon me. I have to make an impossible choice. Would I step into my role as a Seer and face the growing Darkness head on, or would I cower and let everyone I loved suffer and die? The Darkness will rise and the Prophecy remains, the Seer must Fall. Friendships, love, and sacrifice will all play out transforming Izzy into the Seer of prophecy. Find out what happens in The Chronicles of Izzy.